British teenagers Saraya (Florence Pugh) & Zac Knight (Jack Lowden) have grown up with a passion for professional wrestling. Their Dad Patrick aka Ricky Knight (Nick Frost), broke away from a life of crime by embracing the sport with a religious fervour and has been scraping out a living promoting amateur bouts featuring his two kids. With Ricky and his wife Julia (Lena Headey) hanging up their lycra, the parents pin their hopes of fame and fortune on Saraya and Zac, so when the kids get the opportunity to audition for the holy grail of wrestling – WWE – the pressure is on. 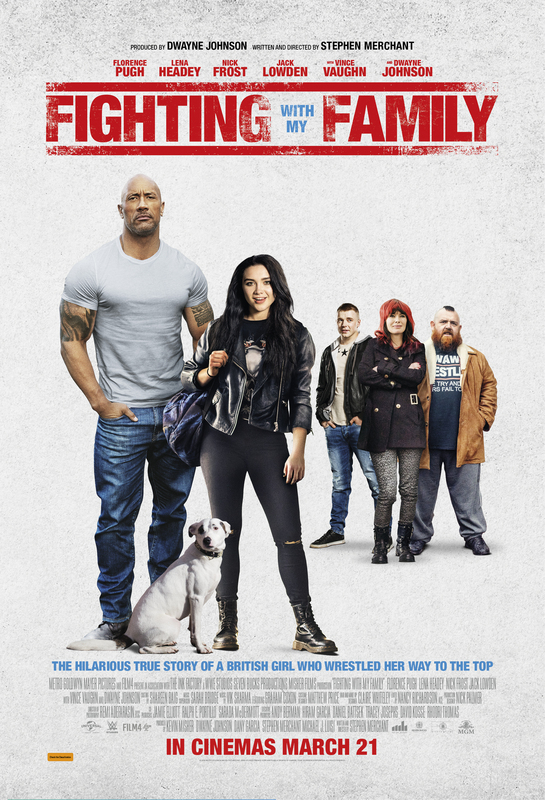 Based on a true story about the professional wrestler Paige and adapted from a 2012 British TV doco, Fighting With My Family really punches above it’s weight, with Stephen Merchant’s script deftly moving between laugh out loud crude humour to tear-jerking moments of heartfelt emotion. Zac’s partner Courtney is pregnant with their child and he struggles to accept that his sister has fulfilled her dream while he has failed in his ambition to become a professional wrestler. The film also works in the idea of a “journeyman” being an essential element in the ascension of every star, a genius riff on Merchant’s relationship with Ricky Gervais. Vince Vaughn is excellent as the coach, nicknamed “Sextape” because he can make people famous, and The Rock pops up for a couple of cameos, one of which is hilarious, and the other thought-provoking as he talks about personalities involved in the fictionalised world of professional wrestling. Made in association with WWE, it’s clearly designed to promote the brand on a more authentic level and it genuinely engaged me more than most films have so far this year. Hilarious Laugh Out Loud Tear-Jerker with a Huge Heart.